The following article is taken from Issue #2 of the INEXPLICATA JOURNAL (Winter 1998). Our friend and colleague Luis Burgos of the Fundación Argentina de Ovnilogía (and later of ICOU as well) provided us with this interesting report on the sobering connection between UFO activity and cattle mutilations. 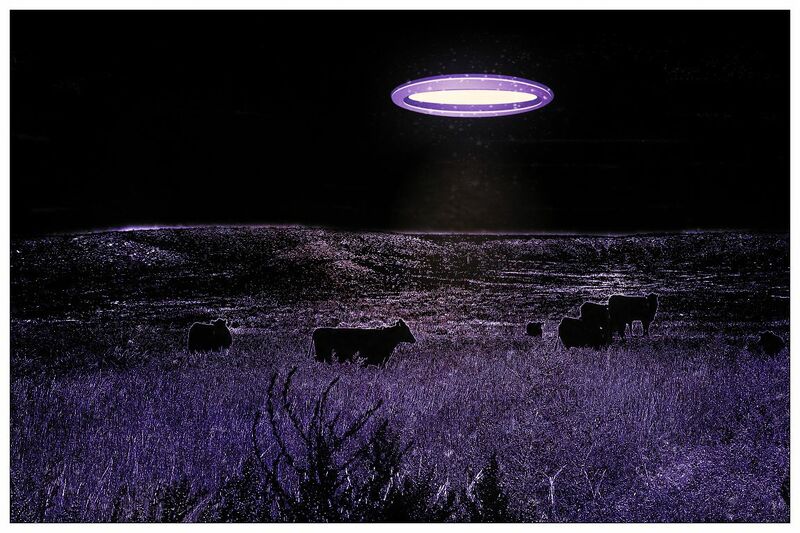 One of the greatest enigmas of the UFO phenomenon began in the early 1970's when a number of states in the U.S. produced hundreds of reports on strange cattle deaths by mutilation -- their organs removed and their blood extracted. From that point on, the "cattle mutilation enigma" spread in a less virulent form to some Central American and Caribbean countries such as Puerto Rico, and with isolated episodes manifesting themselves in the Southern Cone, particularly in Brazil and Argentina. With the passing of time, the hypothesis that cattle mutilations were in fact experiments by the U.S. Air Force, employing black, silent helicopters for purposes of bacteriological warfare against beef cattle, sheep and even horses, began to gain strength. But just as the subject began to "retreat statistically" from the archives of ufologists, similar stories began to emerge with the presence of Puerto Rico's "Moca Vampire" and today's mysterious "Chupacabras", which has made startling appearances in the USA, Puerto Rico, Venezuela and perhaps even Brazil. All of these enigmas have a single point in common: the sightings of nocturnal lights in the vicinity of the events. In other words, UFO sightings. The purpose of this article is to enhance the statistics of "effects upon animals", cows in particular, but placing distance between itself and the "historically famous mutilations" which of themselves already form a monumental database and are the subject of independent analyses. I am specifically referring to animal deaths produced by the passing of a UFO. While such events are not numerous, they nonetheless represent a new aspect. Correa, Province of Sante Fe (Argentina). In October 1968, thirty-two UFO landing marks appear on a field owned by the Damiani brothers in Correa, Santa Fe province. The marks appeared after a fly-by of lights over the area which constituted Argentina's "first massive landing". Witnesses later found the body of a calf whose bones had been shattered precisely in the area of the landing marks. Toward late October, 1970, on a fine sunny afternoon, Pedro Machado,66, and his son Eurípides, 23, who were looking after the cattle in a farm on Alegrete's First District were stunned to observe a calf moving in a direction parallel to the ground at a height of one meter over the ground. The animal then began moving up into the air "as if absorbed by an invisible force." It vanished out of the witnesses' sight some 3 to 4 minutes later. The remains of the calf were never found. Both indirect protagonists of this event were well thought-of in their community. In the early morning hours of September 20, 1971, young Octavio D'Annunzio was heading toward his home in Estación Gil, Coronel Dorrego prospect, in the Province of Buenos Aires, when an unidentified flying object flew over the region at high speed, allowing many local residents to see it. The UFO's approach causes significant symptoms upon D'Annunzio. When military personnel investigates the events, they discover the presence of high levels of radiation, to the extent that film appeared clouded and a number of cows died in a standing position, with their tongues chewed. Carrion birds did not approach the area. This case contains details that are very important to UFO research. In late 1985, when I had the opportunity to investigate the spectacular events at Atalaya with my team from the FAO (Argentine Ufological Foundation), which set the world record in UFO landings, leaving 150 landing marks in a single field, we were able to witness the maneuvers of 4 UFOs over 45 minutes while they performed a veritable air show. A few days later, a completely burned and desiccated cow appeared at a site that had already been surveyed by a number of members. The animal did not appear to have been mutilated, but rather having been exposed to a great thermal source. Unfortunately, we had no way of transferring the carcass to a suitable place for study. At 9:00 p.m. on August 2, 1988, Luis Viveros and his wife Rosa Angulo, along with their 6-year-old son Rodrigo, witnessed "a red light that descended from the sky. The night was stormy although it was not raining, and thunder could be heard in the distance. Suddenly, a powerful detonation caused all the windows in their house to shatter. Frightened, the Viveros opted to head for a neighboring farm. The following morning, when Rosa went to check on the cows, she noticed that the wire fence has been downed, the trees were broken and that her house had become uneven due to disruptions in the terrain. But the most perplexing discovery had to do with two of their cows: one of them was dead, as if frozen, an the other was alive but rigid, also giving the impression of being frozen, for which reason it was necessary to slaughter it. UFOs were seen over the region that evening at La Unión, close to Osorno. Reports from the Argentine Patagonia were also received. During the media-reported events in Victoria, province of Entre Rios, which started in 1991, some ufologists noticed the presence of field animals which had died in strange ways, including a number of cows. These events were associated with the UFO sightings made in the area. A strange phenomenon took place in Realicó, province of La Pampa, beginning at 10 p.m. on the stormy night of Sunday, August 7, 1994. During the course of almost three hours, dozens of cows and horses ran around as if "frightened" by something. 60 millimeters of rain fell during the night and a powerful thunderclap rent the air while a strange buzzing sound made itself noticed. On the following day, ranchers faced a horrifying scene: a number of cows and horses had torn through barbed wire fences and died due to the injuries received during their mad stampede. The causes of the incident were never ascertained, but a number of local residents insisted on having seen a "flying light" over the fields. Shortly after the incident in the Pampas, in 1994, we have word of a smaller case having similar characteristics when the residents of San Manuel became aware that animals had suddenly become spooked after the passage of a UFO, with serious consequences for some of the bovines. Publicado por Terra Incognita en 4:44 p. m.